Old Man Winter - +6% Ship Dodgy for 9 Seconds. 18 Seconds Cooldown. Gunners Luck - +12% Ship Accuracy for 7 Seconds. 14 Seconds Cooldown. Indomitable - +12% Ship Dodgy for 9 Seconds. 18 Seconds Cooldown. Sailor's Hex - +6% Ship Dodgy, +6% Ship Accuracy for 8 Seconds. 16 Seconds Cooldown. Chromatic Yawn - Remove slowing debuffs, 30% Chance of removing rank 1 & 2 Tokens. 16 Seconds Cooldown. Entropic Sphere - -12% Dodgy on enemy for 9 Seconds. 17 Seconds Cooldown. Summer's Breath: 2x Ship Damage Attack, 70% Chance of Fire Token. 13 Seconds Cooldown. Flaring Bar Shot: 2x Ship Damage Attack, 70% Chance of Fire Token. 12 Seconds Cooldown. Wildfire Drake: 3x Ship Damage Attack, 40% Chance of Fire Token. 18 Seconds Cooldown. 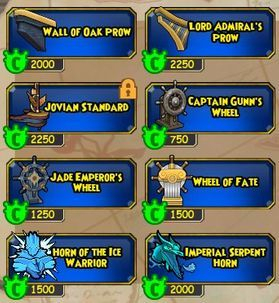 Shark Storm: 3x Ship Damage Attack, 70% Chance of Ice Token. 18 Seconds Cooldown. Simba's Breath: 3x Ship Damage Attack, 40% Chance of Fire Token. 16 Seconds Cooldown. Cephalopod: 3.5x Ship Damage Attack, 40% Chance of Trap Token. 18 Seconds Cooldown. Drake's Breath: 3.5x Ship Damage Attack, 70% Chance of Fire Token. 18 Seconds Cooldown. 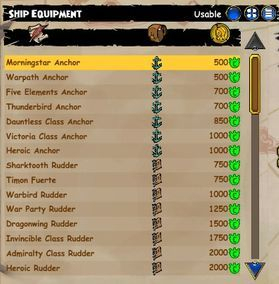 Greek Fire: 2x Ship Damage Attack, 50% Chance of Fire Token. 11 Seconds Cooldown. Carpentry: 15% Ship Repair. 30 Seconds Cooldown. Egret's Blessing: 25% Ship Repair over 10 seconds. 39 Seconds Cooldown. +6% Acceleration, +30% Turning Speed, +13% Boost Speed, +2 Ship Accuracy. Immortal Wings: 10-20% Ship Repair over 8 seconds. 38 Seconds Cooldown. 3x Ship Damage Attack, 40% Chance of Ice Token. 18 Seconds Cooldown. Great Serpent: 3.5x Ship Damage Attack, 70% Chance of Trap Token. 18 Seconds Cooldown. 3.5x Ship Damage Attack, 50% Chance of Trap Token. 17 Seconds Cooldown.